Anokha is a groundbreaking restaurant located across from the hip Short-Pump Town Center in Richmond’s West End, serving signature Nouveau Indian Cuisine. Anokha, which denotes “Unique”, offers diners a new take on Indian food, mixing the flavors and spices of India with western cooking techniques and the finest seasonal ingredients. Anokha’s cuisine offers a symphony of Indian flavors and spices that is sure to excite both the neophyte and the connoisseur alike. We hope you will join us soon in our intimate and contemporary dining room to enjoy our sumptuous offerings paired with a selection from our hand selected wine list or relax in our cozy lounge savoring a fine single malt scotch or a top-shelf tantalizing cocktail. Food is absolutely amazing, and drinks are unique and delicious. The food was delicious. Service was very good as well. I did note that ‘Indian spicy’ was not very spicy at all but this was my only time here so far so can’t say if it was a fluke or not. Will definitely be going back. So flavorful and quality is always great! Good wine menu too. Food was wonderful and very nice portions. Atmosphere was warm , inviting and comfortable. Excellent and professional service, perfect food and beverages.....it was a perfect date night. Highly recommended. This was our first experience at an Indian restaraunt! The service was great and the food was even better! We will definitely be back! Food is some of the best Indian cuisine in Richmond area. I am about halfway through the menu after several visits and everything I’ve had has been terrific. Service very attentive and pleasant. Every time I leave I feel it was money well spent. Excellent food, excellent venue and excellent staff. Could not ask for a better curry house. Anokha is always just right. Never disappointed with Anokha at Richmond Short Pump. The place is nice, the food is great and the service is excellent. Everybody is very friendly and attentive and I always have great time dining there. All that with reasonable prices. I highly recommend it. Overall the food was really good (btw it was Valentine's Day) . Even though it was very crowded, the service was excellent. The food taste, temperature and portion sizes we're great ( wished we had asked for a little more sauce). The cocktails we're tasty and strong which is always a good thing. Naan, the mango lassi, Bhindi masala and Tandoori chicken was fantastic. We'll definitely be back and would recommend this place of business. This is our favorite Indian restaurant. Never fails to provide quality service, the best food, and a good price. We visit every couple of months or when the urge for great Indian food strikes. Everything about Anokha is great! The food is always amazing and we have not had poor service yet and have been many many times! Everyone from the host to the server to the owner is just truly amazingly hospitable! I am lucky to have my favorite place for Indian food so close to me! Perfect dining experience as always! Food was delicious and served was attentive. A pleasure in every way! Love Anokha! Food is fantastic, service is excellent. One of our favorite restaurants. 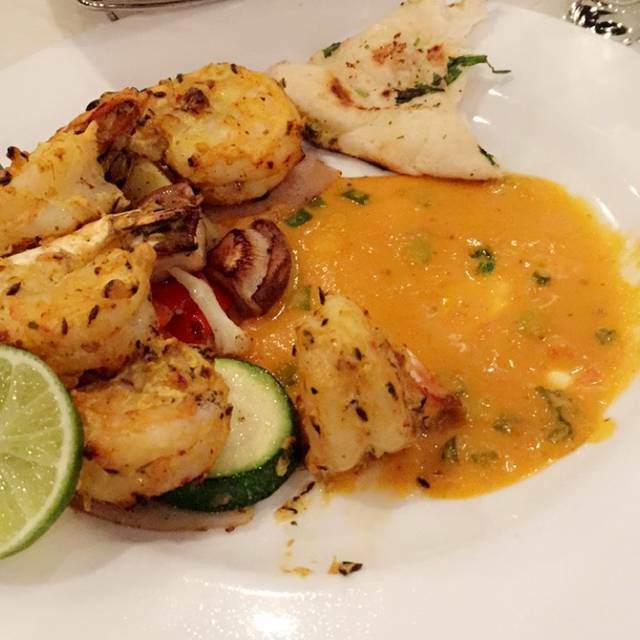 Anokha is our go-to place for Indian cuisine. We have never had a less-than-great meal here. This visit we had the veggie sampler appetizers, plentiful and tasty for only $8. For entrees we had the Lamb Korma (mild for me) and the Lamb Coconut Curry (Indian hot for my husband). The lamb is always well trimmed and the sauce flavorful even when mild. At Anokha we always have the chai tea because their blend is spicy but not peppery. We enjoy their garlic naan and tried the thula kulcha this visit and thought it was crusty and good as well, although the description of being "stuffed" with goat cheese and basil is a little misleading. For a good Indian meal, perhaps not trendy but always tasty and thoughtfully prepared, we depend on Anokha every time. The best indian restaurant in town. Authentic, great service, great value. New Years Eve with family. It's an amazing place, very comfortable, with an outstanding service and delicious food. Eat how many portions of Naan could be possible. Christmas evening. Was crowded. Very loud inside, since the restaurant room is very live (not much to muffle noise). Ordered appetizers and dinner. Dinner arrived first, then about 10 minutes later came the appetizer. Empty dishes never cleared, and since the table was small, things were excessively crowded. As it happened, we also sat in the direct line of cold December air coming in every time the entry door was opened. Food itself was very good. If the ambiance and service were better, we would be happy to return. The food was authentic and delicious. The service was very good and the ambiance warm and inviting. I look forward to my next meal there. This was out first time here and we were dining as a family with our 4 year old. The staff was very friendly and checked in frequently. The food was fabulous. The samosas were light and flavorful, the butter chicken was great, and they even brought our daughter a mango pudding for her birthday. We would absolutely come again and highly recommend it! Food and service both excellent. Food as good as we had on our recent trip to India. Excellent food and service. What more do you want? We all got something different and shared. It was great. The wait staff was really great. My husband & I love this place! The food and service are always excellent! Food was excellent and portions are large. Space is small but still has a good flow. Looking forward to coming back! My son and I really enjoyed our evening at Anokha. The food - which can be ordered on a 1-6 scale of heat - was delicious. We had the Tandoori sampler to start, I had Saag with shrimp, the naan was perfect and the desert a perfect match. Presentation and flavors superb. Deeee-licious lunch menu!!! Salad/soup, entree, side dish, & small dessert!! With buttered naan bread! All for a more than reasonable price!! The attention to Detail is outstanding. Our waiter was on top of it all. My ONLY complaint was the overhead speaker (directly over MY head) was TOOOO Loud. But my ears r sensitive. Fantastic lunch specials. Servicer are first class. We had an excellent meal, and the staff was very attentive and pleasant. We will be going back to try more on the menu! Always great food and service here. One of the best Indian restaurants in RVA. I got the chili chicken and my date got the butter chicken both were delicious. A quick note that the naan is not included with the meals, even if your server makes it seem as though it is. Excellent food and great service! Really enjoyed it. Never a disappointment. All my friends I take from out of town always want to go back with me. Beats all the Indian restaurants, even in the big cities.